The inspiration for City Lights began some time ago during a visit to New York in January. While in Manhattan for a showing of my paintings, friends of ours took Debbie and I to the roof of their apartment building for a bird's eye view of the city. It was after midnight and very cold. 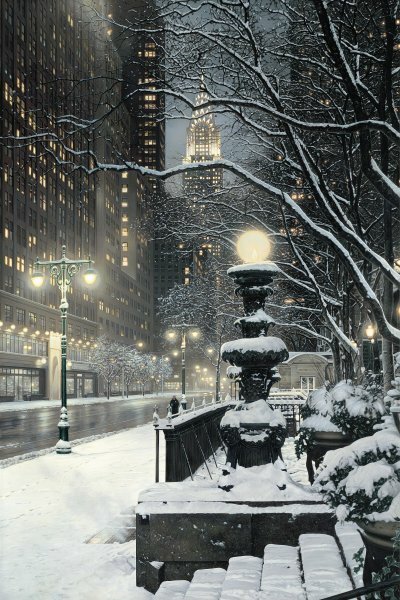 Snow was softly falling, and I remember the sky being lit up from the city lights reflecting off the low hanging clouds. It was an alluring scene and made an indelible impression on me. The Chrysler Building, an art deco masterpiece built between 1928 and 1930, is one of New York's most iconic and beloved skyscrapers. It's at its best at dusk, when the stainless-steel spires glow, and at night, when its illuminated geometric design looks like the backdrop to a Hollywood musical. It is particularly magnificent viewed from ground level along Lexington Avenue.